After Ahmed Mohamed's ordeal, there's no denying that Americans still harbor misguided feelings about Muslims. I worked proudly with Muslim CIA officers in the aftermath of the 9/11 attacks. I used to think most Americans understood that Muslim Americans are patriots, too. 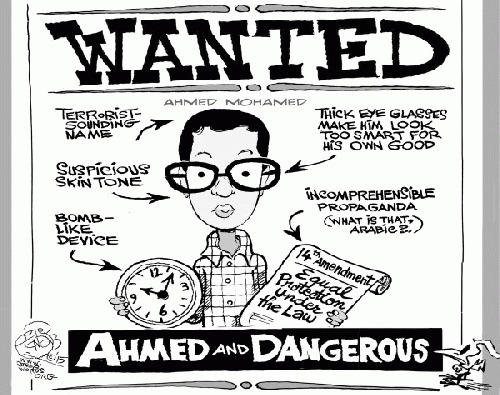 Ahmed Mohamed's recent ordeal proved how wrong I was. He's the 14-year-old who was recently interrogated, arrested, and suspended from his Irving, Texas high school for bringing a clock he made as an engineering project to class. The school said it looked like a bomb. Ahmed had wanted to impress his teachers. Instead, he exposed their racism and became an instant celebrity. Ahmed, by all accounts, is a gifted student with a flair for engineering and science. He reportedly showed the clock to each of his instructors until one of them, his English teacher, advised Ahmed to put it away because it could "scare people." She then said it scared her and reported the teen to the principal, who called police. The reaction around the country was swift, with President Barack Obama, Facebook founder Mark Zuckerberg, and others tweeting their support for Ahmed. He received invitations to visit the White House and MIT, and even internship offers from Twitter and Reddit. Microsoft sent him a high-tech care package. Meanwhile, even as the Texas cops announced that no charges would be filed, MacArthur High School stood by its ludicrous three-day suspension on the grounds that the clock looked like "a hoax bomb." There are so many things wrong with this story. First, the incident smacks of racism. It's a cold, hard fact that in the past decade many more people have been killed in the United States by right-wing extremists than by Muslim fundamentalists. Are teachers in Irving, Texas equally suspicious of blond-haired, blue-eyed conservative kids who have a way with wires as they are of Ahmed Mohamed? I doubt it. Remember, earlier this year near Dallas, locals tried to block the establishment of a Muslim cemetery. One local Baptist leader said he was afraid the cemetery would attract the "radical element of Islam," as if al-Qaeda would camp out to be near the bodies. The good pastor added, "How can we stop a mosque or a madrassa training center from going in there?" That's true enlightenment. Second, what teacher in his or her right mind would run screaming to the principal's office when an honor-roll student, who'd never been in trouble, shows the teacher the invention he'd been bragging about all day? If you built a bomb, would you really show it to every teacher in the school? The teacher knew the thing was a clock. The complaint to the principal was malicious. And what kind of principal, armed with the same information, then calls the cops? Finally, what kind of a cop would arrest a geeky kid for bringing a clock to school? It's no wonder that the Mohamed family plans to transfer Ahmed to a new school after exploring all his options.